OXNARD, California -- A California police K-9 died suddenly Thursday after an inoperable tumor was found on his heart. 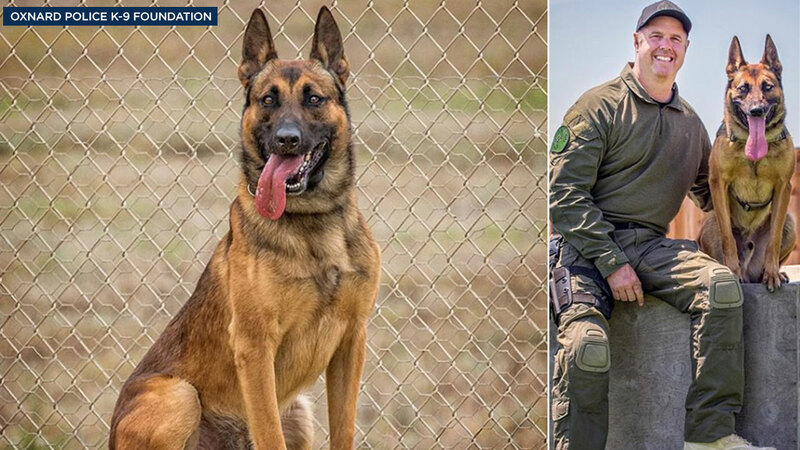 The Belgian Malinois named Jax showed signs of an illness during training Wednesday, according to the Oxnard Police K-9 Instagram page. He was taken to a veterinary hospital, and after undergoing tests and X-rays, the large tumor was found on his heart. When veterinarians discovered the tumor, it had already ruptured and caused massive internal bleeding, according to the post. "Tonight, surrounded by his family, he succumbed to his injuries," the post read. Jax was 5 years old and recently rode on the Lucy Pet Foundation float, which honored heroic pets for the 2018 Rose Parade. "Jax was known for being an extremely tough, high-drive Malinois who loved nothing more than to jump in that truck and go to work every day," the post said. "He epitomized what it means to have the heart of a lion." Jax's partner was Senior Officer Danny Casson, whose family waited for the dog to come home from work every day to "greet him with hugs and kisses."